BOHOL, the Philippines -- When you think about the Philippines, your first thoughts might be of Cebu or Palawan. But if you want to experience a travel destination that is more natural, more unexplored, Bohol -- the country’s 10th-largest island -- may just be perfect. Bohol, which boasts dense forests and amazing beaches with crystal-clear water, offers diverse marine activities such as swimming, snorkeling and scuba diving. There are also two unique attractions that you cannot experience elsewhere: the Chocolate Hills and the world’s smallest primate, the tarsier. 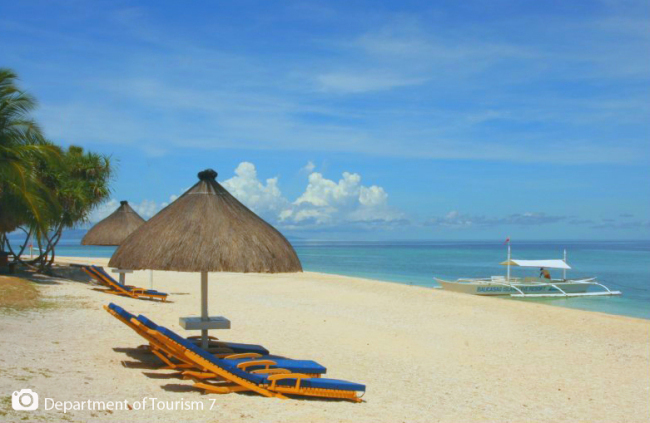 Many tourists begin their journey from Panglao Island, which is the largest of the 70 small islands of Bohol. About 25 minutes by car from Tagbilaran airport, Panglao Island has many luxurious resorts sitting on the shores of Alona Beach. On Day one, you can take a ferry from Panglao Island to Virgin Island, which is around 20 minutes away. Virgin Island is probably the most iconic island destinations in Bohol due to its long stretch of sand beach which spans around a hectare during low tide. Tourists can freely walk around in the shallow waters with beautiful colors a little lighter than the color of the sky. It is a very small island that lets you enjoy the true value of nature. There are vendors selling diverse, fresh seafood, such as abalone, sea cucumber and sea urchins, with coconut water and beer. If you have finished relaxing at the beach, you can leave for Balicasag Island for more water adventures. It takes about 15 to 20 minutes from Virgin Island. Balicasag Island, surrounded by a sandy shell coralline beach, is the perfect place for marine activities, such as scuba diving and snorkeling, for both beginners and advanced divers. If you are a beginner, you can try snorkeling in the cliff face area. If you are an advanced diver, you can dive 40 meters down to see thriving coralreefs with a school of turtles and fish like mackerel and barracudas. Bohol is not for beach lovers only. The main island’s Chocolate Hills consist of 1,268 hills, which stand out because of their uniform shapes – almost perfectly conical and mostly 30 to 50 meters high. They are covered with grass, which, at the end of the dry season, turns chocolate brown. The Chocolate Hills, which are currently on the tentative list for inclusion as a UNESCO World Heritage site, are formed of karst limestone, made of ancient coral reefs and eroded by the elements. The top of the “Chocolate Hills Complex,” one of the main vantage points, located in Carmen town, offers a 360-degree view of the hills and the feeling of being in the center of a massive forest. The Chocolate Hills has a romantic legend. A giant named Arogo fell in love with Aloya, a simple mortal. 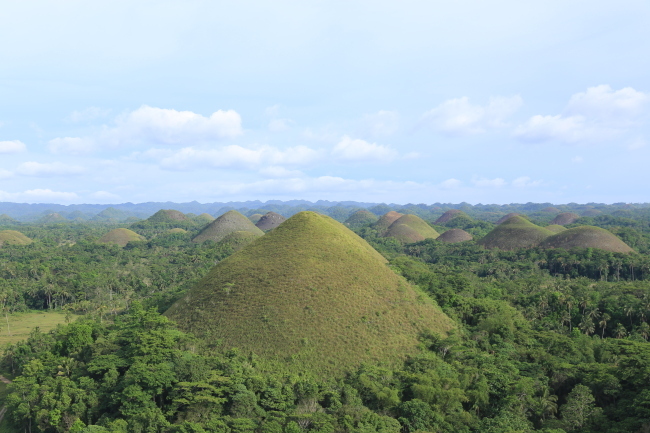 When Aloya died, Arogo could not stop crying and when his tears dried, the Chocolate Hills were formed. Along with the Chocolate Hills, the world’s smallest primate, Tarsiers, are another star attraction here. You can see them some 30 minutes’ drive south of the Chocolate Hills. Tarsiers range from 10 to 15 centimeters in length but have large eyes and a slender tail from 20 to 25 cm long. Although they have big eyes, their eyeballs do not move, so they have to move their heads to see right or left. 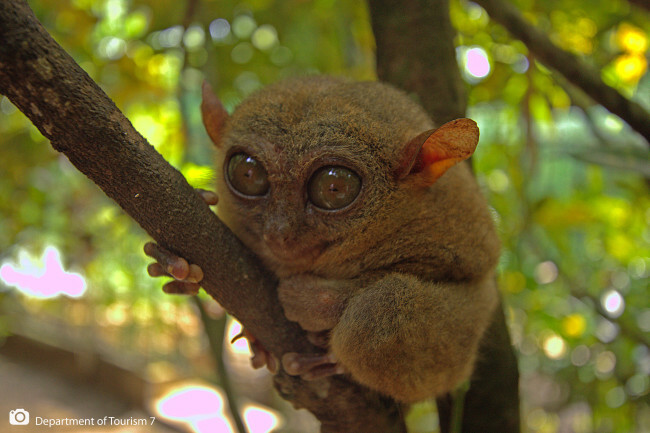 According to the Philippine Department of Tourism, there are more than 100 Tarsiers in Bohol, but tourists can actually see less than 10 Tarsiers in the Tarsier Conservation Area. This is because tarsiers are vulnerable to stress, and the area keeps the rest away from humans as part of efforts to save them from extinction. Tarsiers are quiet and mildly behaved -- unlike other more boistrous monkeys -- so tourists can watch and take photos of them at leisure. 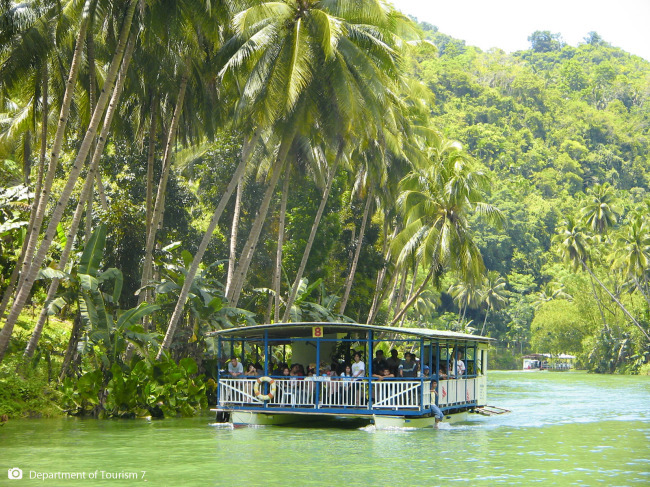 After you enjoy the two unique attractions of Bohol, you can leave for the Loboc River for a meal on a floating restaurant. One popular destination in Bohol is the Loboc River, where one can get board a floating restaurant and enjoy the Loboc River cruise with a buffet meal while sailing along the 21-kilometer river. The Loboc River, which is also called the Amazon of the Philippines, is one of the cleanest rivers in the country. As you near the end of the journey, you can see local women and girls in their traditional green clothes performing a traditional Philippine folk dance, Tinikling. The Loboc River cruise starts at the Loay Bridge which is located in the neighboring town of Loay and the cruise usually takes an hour or so. On the third day, you could enjoy the Alona Beach on Panglao Island. Alona Beach is a small stretch of tropical paradise on Panglao Island. It is quickly becoming one of the top travel destinations in the Philippines because of its wonderful white sand beach and beautiful blue waters. Some tourists are seen spending their day reading, sunbathing or strolling along the beach. Although Alona Beach is beautiful to look at, it is not the perfect place to swim because of the coral reefs and clams near the beach. To wrap up the journey and buy souvenirs from Bohol for your families and friends back home, Bohol Bee Farm is a good place. The Bohol Bee Farm is a very cozy and relaxing place on Panglao Island. You can have organic meals and also buy honey, spread, jams and tea as gifts. There are direct flights from Korea to Bohol via Philippine Airlines on Wednesday, Thursday, Saturday and Sunday, which take around four and a half hours. From Dec. 20, the airline will fly daily nonstop to Bohol. If you travel to Bohol this year, you might encounter some problems. Although rarely, flights scheduled to land at Tagbilaran airport in Bohol may be diverted to Mactan–Cebu International Airport when sun has set. This is because airplanes cannot land on Tagbilaran airport after sunset, as there are no landing lights. If you find yourself in such a situation, you will have to take a ferry from Cebu to Bohol, which takes two hours on a fast ferry and four hours on a slow ferry. A new international airport is being built in Bohol, which will probably open early next year, to allow nighttime flights. The trip to Bohol was carried out through a diplomatic tour program hosted by the Embassy of the Republic of the Philippines in Korea. The diplomatic program is part of the Philippine government's efforts to step up its commitment to promote the country's tourism destinations. Since 2015, the program has been run for destinations including Boracay, Cebu, Puerto Princesa and Coron. Tourism contributed 12.2 percent to the Philippine economy in 2017, according to the government’s statistics agency PSA. South Korea remains the top tourist market for the Philippines, with the number of visitors to the Philippines tripling over past eight years.